Sometimes all you need is a bouquet from Sister Sophy. To say to each other what we do so little with words. Your trust is everything to us. We are proud of you. We belong together. Today we are thinking about you. I love you. Very business-like, or very personal. Moments enough when these words can flourish. A birthday or anniversary. A collaboration or a delivery. And perhaps the best way: just simply because. The delicate, smiling flowers of Sister Sophy can be seen in their hearts and never lie. They are always beautiful and love company. Because of their honest preciousness, the bouquets from Sister Sophy have grabbed so many organizations from the heart. A premium brand for everyone who wants to be experienced as a premium brand. Sister Sophy stands for beauty, honesty, originality, solidarity and more fair trade. It is great to be surprised with an exclusive bouquet of Sister Sophy, stylish and surprisingly packaged. One great experience of which you will become the director with one e-mail or phone call. Helps us to ensure that only fair flowers are available. 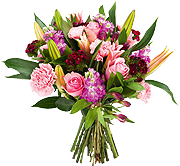 We want to work towards a point that all bouquets from Sister Sophy are 100% fair and that requires volume. Once we have sufficient volume, we will tackle the chain and ensure that the entire flower chain will become fair. Help us to send fair flowers. Against child labor. For fair trade. For a better environment. For a better earth. For us all. Help us and share Sister Sophy with your colleagues, friends, and family. Only we can send flowers but together we can handle the entire world.